Arguably one of the most important statues of Emperor Augustus, the Augustus of Prima Porta is certainly one of the best preserved portraits we have of him today. This beautifully decorated statue, expertly carved in marble from the Greek island of Paros, was discovered 20 April 1863 during archaeological excavations at the villa of the Emperor’s wife, Livia Drusilla. Despite a few breaks the statue is all but complete, and the excavators recorded immediately noticeable traces of colour. Not surprising then it has gone on to be one of the most iconic images of the Roman Empire’s first emperor. Livia’s Villa was in a suburb north of Rome along the via Flaminia – a road that ran between Rome and the Adriatic Sea. The area took its name from the gate that was formed by the arch of an aqueduct crossing the ancient Roman road. As the gate was the first sign that travellers to Rome had reached the city of Rome, it became known as the Prima Porta, or first door. hence the name given to the statue. The statue is at once allegorical and political. Augustus is in military dress, wearing a highly decorated cuirass (breastplate) and a cloak draped around his hips. He is carrying a consular baton, while his raised right hand indicates he is addressing his troops. August is also depicted barefoot, usually only gods were depicted in this manner. The Emperor’s divine status is alluded to further in the statue’s support, carved to show cupid riding a dolphin; Venus was cupid’s mother. Although found in Livia’s Villa, to which she retired after her husband’s death in 14 AD, it would have originally been in a public space. The iconography of both military leadership and divinity are combined on a youthful body to cast the Emperor as an exceptional man – the best to rule Rome. The Prima Porta statue in colour. When the statue was unearthed, it was noted that there were clear traces of colour on the Parian marble. These colours have faded over the years, and also because plaster casts were made without protecting the statue’s surface to the point where they are no longer visible. A cleaning process carried out in 1999 confirmed the initial reports that the statue was coloured. This encouraged conservation staff at the Vatican Museums to investigate further. In tests carried out in 2002 using ultraviolet photography further traces of pigment invisible to the naked eye were detected. And the results of this extensive examination by the Stone Restoration Laboratory in the Vatican showed that a palette of about five or six colours was used. A copy of the statue was coloured according to the results of the ultraviolet photography, pictured here. What is immediately obvious is that the skin and the background of the cuirass were left as is. Colour was applied to clothing, the decoration on the cuirass, the hair, parts of the eyes, and the lips. Not everyone accepts this reconstruction; there is a feeling that the colours are gaudy and exaggerated. Fabio Barry, for example, an art historian at Scotland’s University of St. Andrews said the statue “looks like a cross-dresser trying to hail a taxi” (read more about Barry’s reaction in the Washington Post). The colouring of statues like the Augusta Prima Porta produces images that are a stark contrast to the images we have have become familiar with. And certainly challenges that way in which we have viewed Classical sculptures for centuries. The slightly over the top, negative reaction is almost certainly a result, in part at least, of our appreciation of these statues is being pushed beyond a comfort zone. They are simply not what we are used to seeing in museum galleries (who have often destroyed Classical antiquities in their cleaning processes) and art history books. A full account of the research carried out on this and other statues can be read on the Digital Sculpture Project’s website. 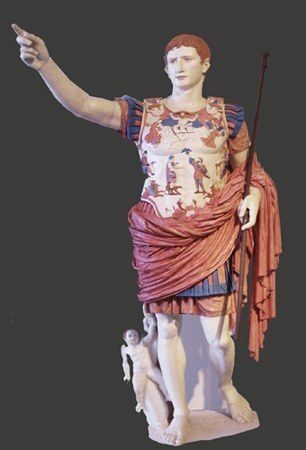 Were is the Augustus of Prima Porta Statue? This extraordinary statue can normally be seen in the Braccia Nuovo (New Wing) of the Vatican Museums in the Vatican city. The ‘new wing’ was built as part of a re-organisation of the Vatican’s Pontifical collections that followed the return from France of those objects that had been confiscated by Napoleon. The Braccia Nuovo was completed in 1822. Until mid July 2014, the Augustus of Prima Porta can be seen in Paris. Here it is the centrepiece of a temporary exhibition about the life and legacy of Augustus at the Grand Palais. 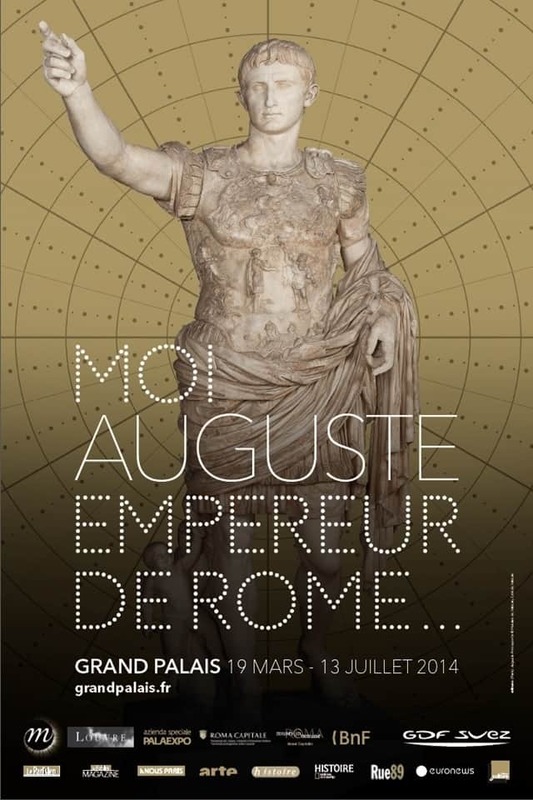 Moi Auguste, Empereur de Rome opened on 19 March and runs until 13 July 2014 (for more details, visit the exhibition’s website).